The giesser bread/cake knife 10mm wavy edge primeline is a perfect professional cake trimming, lifting and positioning decoration tool. The offset blade allows for maximum precision while keeping your hands away from the icing. Anything from cupcake decorating to wedding cake decorating, this knife set can handle the biggest and smallest of decorating jobs. Made of high quality stainless steel with a high quality plastic handle allows you to hold a comfortable grip. 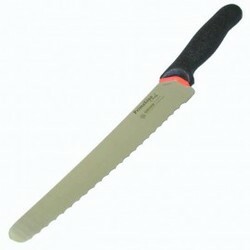 The flexible stainless steel blade has a perfect gliding thickness over icing.